Yes, I know, everybody is sick of vampire/supernatural fiction. It’s everywhere isn’t it? And it’s getting hard to decipher between the good from the “I want a bit of Stephenie Meyer’s fame” books! But if you are sick of all the vampires (I am not, I’ll admit! ), then this is the book for you. This vampire book doesn’t do what it says on the tin! This is the vampire book where vampires have no power, are always sick and are not even attractive. Underworld, Anne Rice and Stephenie Meyer are referenced in the book, and Nina, the main protagonist is the published author of a vampire series called Zadia Bloodstone, a series which as it is described remind me a little bit of Laurel K. Hamilton. Nina has been 15 since 1973 and she hates being a vampire! 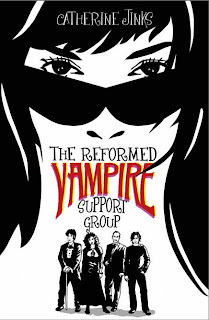 She is a member of group of reformed vampires organised by a Catholic priest who meet up every week in a his church. When their eldest and most unwillingly reformed comrade (he has “fathered” many of the members of the group) is murdered, they decide to take on themselves to find the slayer and show him the errors of his ways. But they soon find themselves implicated in a dangerous quest full of guns, thugs, oh, guess what …. a werewolf! This is seriously funny at times and a brilliant new take on the vampire myth which will delight young readers, whether they are Twilighters or not! Catherine Jinks is obviously a renowned author in her native Australia but I had never heard of her. I think her next project is The Abused Werewolf Rescue Group. Cool review 🙂 It’s such a funny book!